The Moxon Rectangle was first introduced by Les Moxon, G6XN during the 1950's. 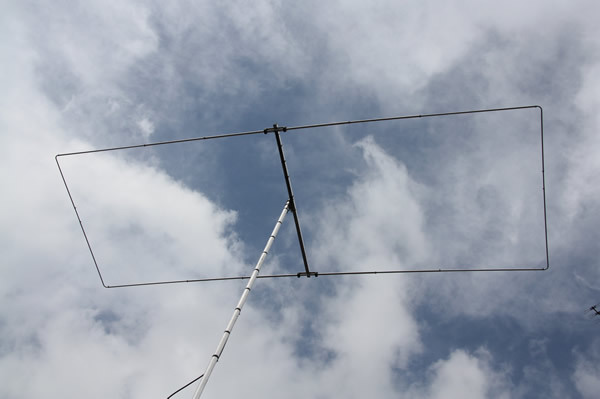 Since then it has been a very popular limited space Yagi do to its very compact size. The Moxon Rectangle comprises of 2 elements, a driven element and a reflector element. The tips of each element are bent towards the other with the ga being filled by an insulator to help support the ends of both elements. This results in a rectangluar shaped antenna with directional properties and very good F/B ratio. G0KSC has taken the original design and applied modern computer optimisation techniques to talior performance to suit specific bands (these are not simply scaled from one band to another) whcih results in exceptional, band-specific performance. The Moxon works very nice on 20m without any Tuner on the full 20m Band with very good SWR. This was also my first choice why i had bought this Antenna. The second choice was the Diameter of this Antenna, which is a quite a bit smaller than a 2 Element Yagi for 20m. Our antennas are constructed with the best quality materials in order that the best mechanical construction can be achieved, not the cheapest and most profitable! Even a digital caliper is used (with an accuracy of 1mm) to measure the elements during production to ensure they are within 1mm of what they should be, this ensures performance is delivered. SWR=1.0 with short (30cm) test cable including 2 turns choke balun. SWR=1.1 with 20m actual cable including the balun. This antenna is made with tapered element sections starting at 1'' tube and finishing at 1/2'' tube. It also has fully insulated elements which will ensure continuous, high performance and ensures corrosion will not impact performance. Marine grade stainless steel is used throughout. M4 terminal coaxial termination is provided on this antenna along with a UV resistant Rubber paint (including applicator) in order to ensure all open connections can be thoroughly sealed before final installation. The boom is 1.25'' inch square 16SWG aluminium to ensure strength and rigidity and has a safe wind speed handling of well over 100MPH.